Powers: CyberFace has immense electro-magnetic abilities that allow him to effortlessly manipulate huge amounts of technology. He also possesses great strength and invulnerability. Sebastian Khan was the lieutenant to Antonio Seghetti when he ran the mob that ruled over organised crime in Chicago. When the freak population begun to rise in the city and gradually encroached onto the mob’s territories, Seghetti began to make plans. He had his technologically-skilled second-in-command, Khan, work on a method to allow him to maintain his power. Khan worked with the CyberData organisation to work on a suit of armour for his employer and friend. A prototype was created in the form of Dread Knight for the dictator of Lieberheim, an ally of Seghetti. OverLord was soon created and the freaks were forced to serve under him in the newly created Vicious Circle. As this organisation rose in power, Khan was cast aside as if he were nothing. Enraged by his rejection, Sebastian Khan used the resources of CyberData to imbue himself with superhuman abilities, taking on the name of CyberFace. His power potential was immense and he sought to take revenge upon OverLord. A number of disgruntled Vicious Circle freaks were recruited into a splinter group dubbed the Annihilators. They began a campaign to seize control of their parent group. The Annihilators clashed with the Freak Force team when they were still affiliated with the Chicago Police Department. CyberFace was not successful initially and was in fact apprehended before getting poisoned to death by Assassin. He was later resurrected by the government’s Project: Born Again division so that he could testify against OverLord. CyberFace escaped from government custody but, mentally unstable from his ordeal, he wandered through Chicago aimlessly until he was taken in by the Underground Freaks. He was cared for Beast Boy and Feezle until a device created by Octopus allowed the villain to control CyberFace’s mind and body. Octopus was arrested and his pawn was again taken into police custody. The Vicious Circle was dispatched to assassinate CyberFace once more but he is saved by Dragon and his fellow officers. 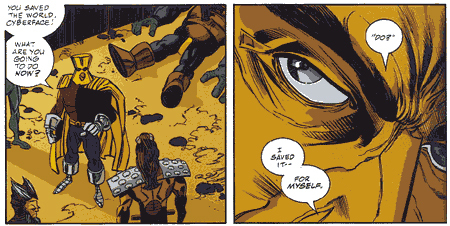 He then made a move after OverLord’s death and seized control of the villain group. The unstable nature of CyberFace’s body meant that he was dying again. A later clash with Dragon caused his body to explode but his head was saved by Octopus, giving him a new lease of life. He was fitted with BrainiApe’s body and OverLord’s armour. Horde had taken over as leader of the Vicious Circle and CyberFace wanted it back, only to have his head destroyed by BrainiApe’s brain, Adolf Hitler. This third apparent death was not the end of CyberFace though as he returned when Dragon switched realities to a different Earth. 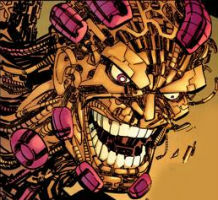 In this reality, CyberFace was still not only leading the Vicious Circle but was also the reigning king of the world. He used alien technology stolen from the Cosmic Cops and Martians to create what seemed like unbeatable empire. Dragon spent a few years trying to depose the villain, recruiting rejected Vicious Circle members and heroes alike along the way until a final climactic battle at the White House. CyberFace fled this scene and teleported up to Vanguard’s spaceship that he had commandeered months ago. He was pursued by Dragon who eventually defeated his foe, leaving him powerless in an isolation booth that had been built by the Creator. CyberFace was to remain imprisoned here indefinitely but Vanguard’s companion Wally felt that he would eventually succumb to CyberFace’s mental suggestions and release him. He instead blew up the head of the fallen dictator and, with Vanguard, teleported the corpse into the heart of the Sun.